One day when I was a junior in high school, I saw a board game that caught my eye at Get Your Game On, a games and cards shop a few bus stops from home. It’s name, The Game of Urban Renewal caught my eye just because of the name. I had heard of Urban Renewal from the name of the building editor to SimCity 2000. I only saw the game once there and didn’t ever end up playing it. Somehow freshman year at NYU I ended up finding out more about the game online and looking up the ruleset. It’s perhaps the most fascinating ruleset I’ve ever seen for a city building game and many other indie city games that don’t follow the SimCity formula of zoning and absolute control use some of the same ideas. 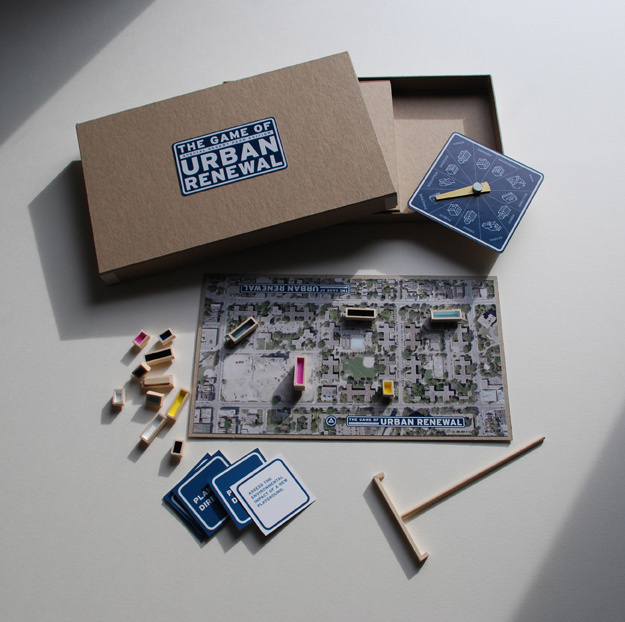 The Game of Urban Renewal (pdf) is a multiplayer city building game by artist Flavio Trevisan in 2011. Though one player is mayor, everyone else can be any number of roles from City Councilor to Resident of Existing Development to be Demolished to Skyscraper Enthusiast to Garbage Man. These roles, outside of Mayor and City Planning Employee, don’t seem to have any specific rules associated with them. The players instead role play as the different characters and try to make decisions based on that point of view. Unlike SimCity where the mayor can place anything anywhere at any time at all limited only by their imagination and funding, the city here is determined by Decision Engine Wheel, a wheel for choosing random actions similar to the wheel in the The Game of Life (Milton Bradley). Players take turns spinning the wheel and placing and stacking condominiums, commercial buildings, public housing, schools and parks. They might also land on the chance to pick up a planning directive card from a deck. Lastly, they could land on the chance to bulldoze as much (or as little) as they want, therby creating the cycle of urban renewal, hence the game’s name. Like SimCity, The Game of Urban Renewal lacks any formal scoring, winning or loosing, or ending. Yet unlike SimCity, this game lacks engaging challenge and a dynamic environment. I assume that Flavio Trevisan’s intent behind this game was to draw attention to urban renewal in Regent Park, Toronto where a “Revitalization Project” was already well underway in 2011. In that way, the game was more statement than game. However, a more recent stab by Paolo Pedercini. MultipliCITY is a game “antidote/response to SimCity” made for the Allied Media Conference in 2014. Pedercini has excellent presentation notes alongside the rules of the game. 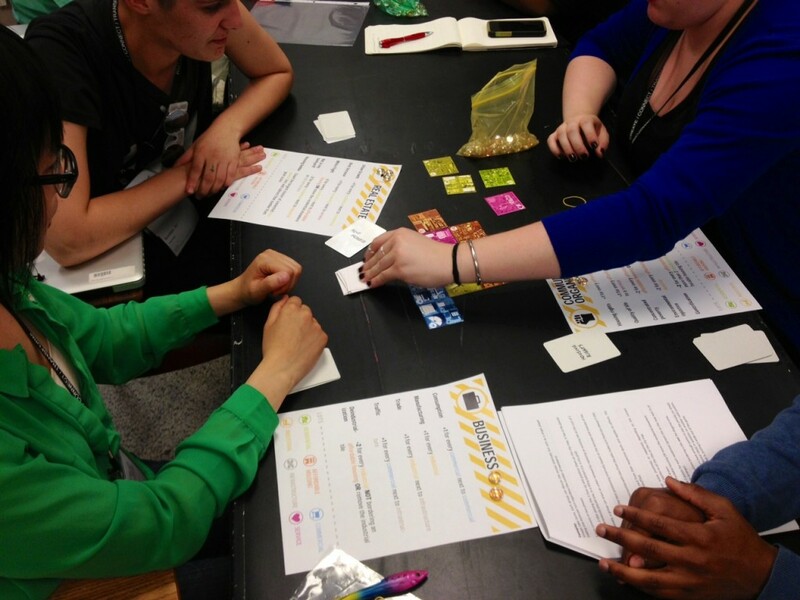 Unlike The Game of Urban Renewal, MultipliCITY uses scoring to incentivise the different driving forces behind a city’s development from Real Estate, Commercial, to Community Organizers. Each group has a different scoring system to codify their different ideals. 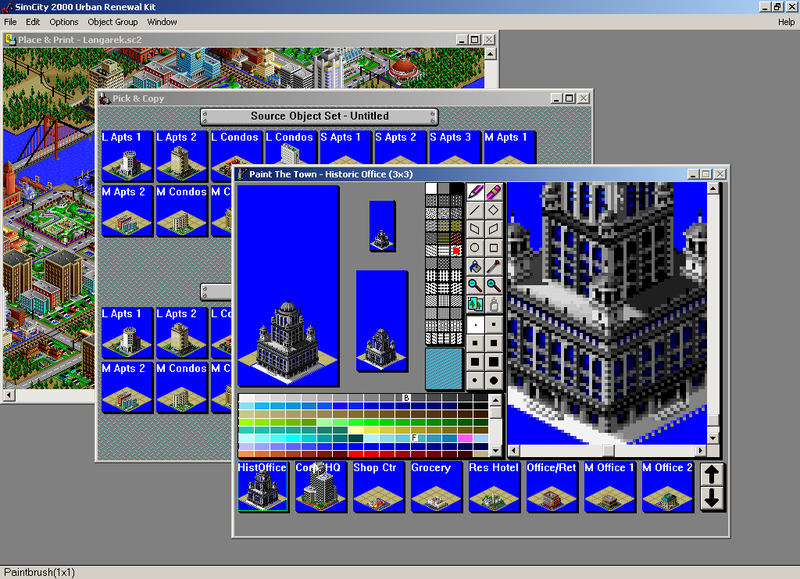 Like The Game of Urban Renewal, the game uses randomness to let players take turn placing buildings, yet lacks the unending renewal theme as the game ends when the stack of buildings to place runs out. The ideas Pedercini explored are really fascinating as they try to truly explore how a modern democratic city forms.